God has called us to this place of peace and quiet. We come, eager for rest and hope. The Lord is always with us, offering us refreshment for our souls. Let us partake of this wondrous gift. It is the gift of the Lord’s love for us. Come and rest. 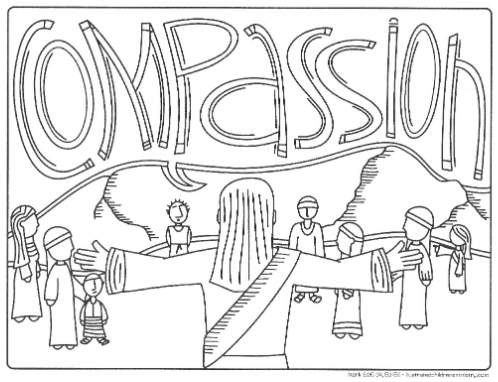 Praise God for the absolute compassion of God’s love. AMEN. Pastor Kelly will be back from vacation this week, and will be in the office for her usual Summer office hours on Thursday from 10am to 2pm. Carolyn, Sharon, Edmond, Virginia, Jim B., Shannon, Kristen, Gordon, Susan, David W, Sue, Steve, Lynne, Richard, Emily, Ron & Margretha, Tanya, Alex & Ashley, Lydia, Maryam, Barbara, Sandie. The Singley Family. If you are interested in reading ahead, next week in worship our scripture reading will be John 6:1-21. Throughout the summer we are collecting school supplies to help families in our area. If you would like to donate pencils, notebooks, crayons, markers or any other school supplies, there is a box by the door where you can leave them. Thank you in advance for your generosity. Do you have books you are no longer reading? Consider donating them to be sold in the “Book Room” at our Fall Church Fair. There is a collection bin in Maxcy Hall. We’re loving all of the pictures from Flat Jesus’ adventures with you this summer, so keep sending them to us at flatjesus@oldtownucc.org. Did your Flat Jesus get lost somewhere in your travels? No worries, just email us and we’ll make sure to get you another.